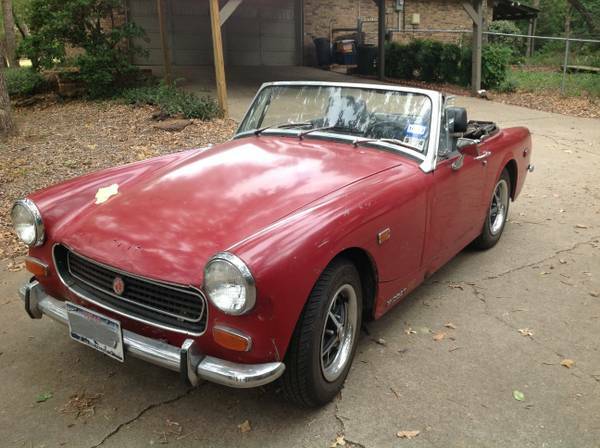 While twin overhead cams, aluminum heads, and 5-speed transmissions are all exciting, there’s something very appealing about a simple little car like the MG Midget. It’s everything you need to define it as a car, and nothing more, much like, say, a pizza margherita or simple pasta and tomato sauce. And true to both, because there’s not a bunch of fancy features to distract the driver/eater, the basic product is a test of its maker’s abilities. Just as some chefs can make a great pizza margherita, so MG made some great sports cars, and with the Midget, they proved that even the most basic, stripped down of sports cars could still be a lot of fun. 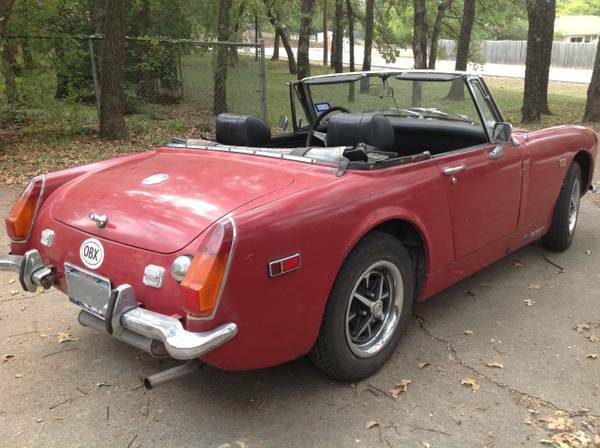 You can find this 1974 MG Midget for sale for $4000 in Keller, TX. Simple technology in a super-light package – the essence of what makes a sports car great. Output from the 1275cc A-series was 54.5bhp and 67lb.-ft. of torque. Needless to say, there’s a whole shelf full of performance modifications you can do, but there’s something to be said for enjoying this as MG’s engineers intended, and you can save the power modifications for another car. Later cars gained safety upgrades, not that any of that will help you now if you get in the path of a wayward Expedition. From 1972 – 1974, Midgets featured round rear wheel arches and a split rear bumper, after which MG was forced to add on Sabrinas for half a year, and then the hideous rubber bumpers to pass federal safety approvals. Although this car is a 1974, it has neither the Sabrinas nor the rubber bumpers, which suggests it’s a 1973 that hung around on the dealer’s lot for a while. It also benefits from a Rivergate 5-speed conversion (Richard Nixon’s approved transmission conversion shop, by the way). The overall appearance is of a well-used, well-loved car that’s nicely worn around the edges, and will continue to faithfully serve its owner with regular maintenance. 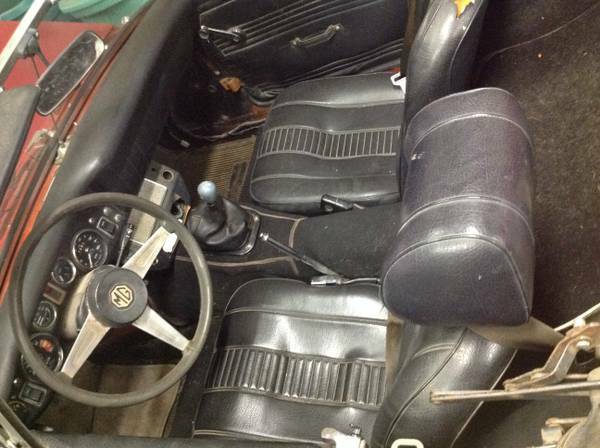 The seller has owned the car for about 20 years, and in that time rebuilt the engine, suspension, steering, and brakes. The car also comes with a factory hardtop and a current inspection, should it remain in Texas. The car is said to need body work, although the tub is solid, and comes with replacement front fenders. It also comes with many spare parts, including a distributor with a Pertronix conversion. 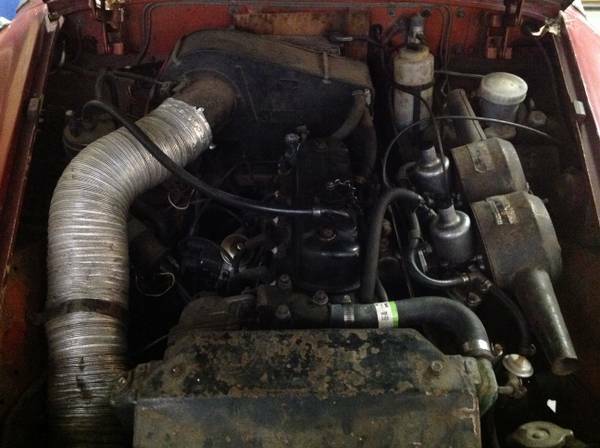 The engine is said to show good oil pressure and to run very well. While the burgundy paint on this car can disguise many flaws, it would be nice if this car were just solid enough to continue on as is, the automotive equivalent of a comfortably worn-in pair of jeans. This entry was posted on March 27, 2014 at 4:42 pm and is filed under Feature. You can follow any responses to this entry through the RSS 2.0 feed. You can leave a response, or trackback from your own site.